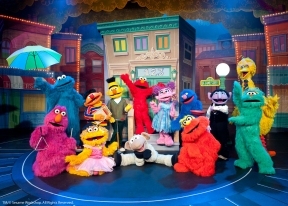 The all-new Sesame Street Live “Can’t Stop Singing” is at Rialto Square Theatre, 15 East Van Buren Street in Joliet, IL on Wednesday, April 2 at 10:30 a.m. and 6:30 p.m.. Don’t miss a chance to see your favorites like Elmo, Abby Cadabby and Murray. Sesame Street Live “Can’t Stop Singing” offers a fun-filled learning experience packed with the razzle-dazzle of interactive live performance, including up-close and personal interactions on the audience floor! Like television’s Sesame Street, each Sesame Street Live production features timeless lessons for all ages. Tickets are now available, with prices at $12 and $19. A limited number of $29 Gold Circle seats and $55 Sunny Seats are also available. A facility of $3 will be added to all ticket prices. Additional fees and special offers may apply. To charge tickets by phone, please call Ticketmaster at 800-745-3000. Tickets may also be purchased online at www.ticketmaster.com. For information online, please visit www.sesamestreetlive.com.